Gordon Gauchat published a paper in American Sociological Review in 2012 (paywalled), reporting that political conservatives in the United States lost confidence in the scientific community from the 1970s to 2010, while political liberals and moderates did not. As a result, a political divide opened up so that by 2010 conservatives had the lowest level of confidence in science. I’ve written a short working paper that extends the trends through the 2016 General Social Survey. 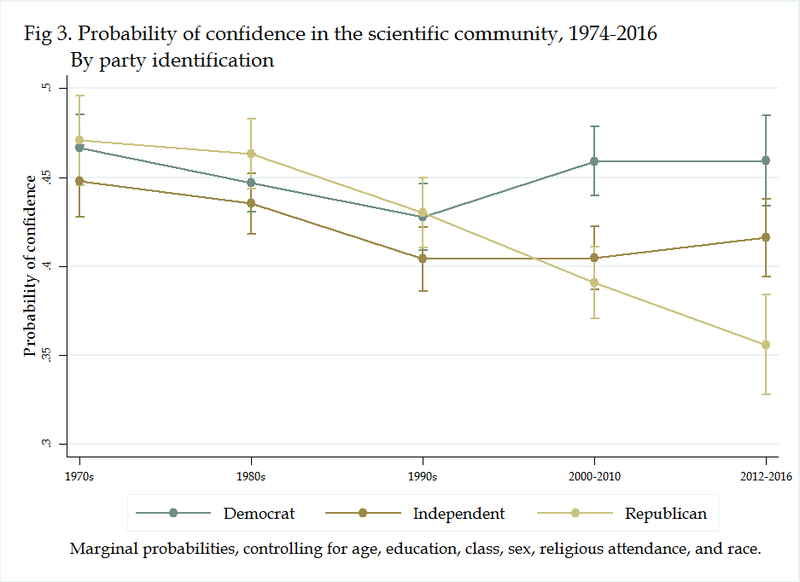 I find that political conservatives, Republicans, and Americans who attend religious services regularly, all demonstrate falling levels of confidence in the scientific community. Further, for the most recent period (2012-2016) educational attainment, for conservatives, is not associated with increased levels of confidence in science, except at the graduate degree level (and even there confidence is lower among conservatives). It’s as if conservative views on science are impervious to education. I have only a few sentences about politics in the paper, but the gist of it is that this divide is bad, it undermines democracy, and plays into Trump’s authoritarian hands. 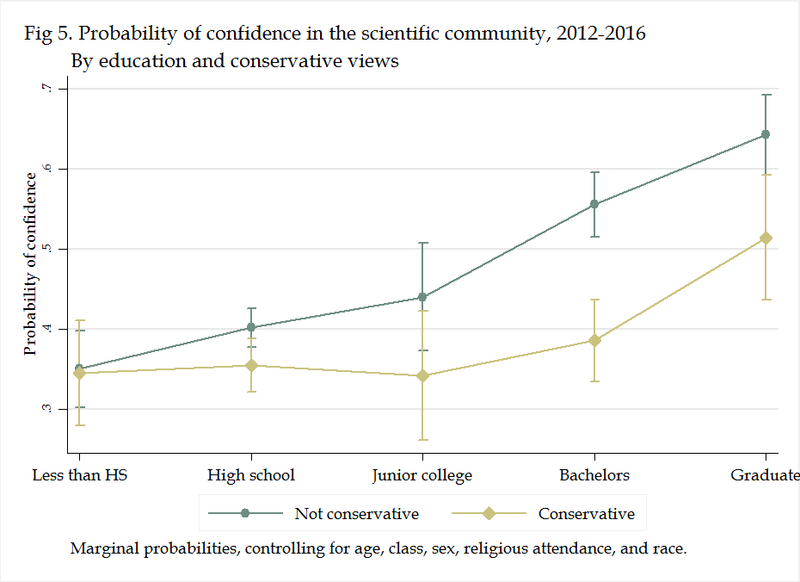 And here’s the figure from the recent period, showing that conservatives have lower levels of confidence regardless of education level — and education has no relationship to confidence in science for them, up to the level of graduate degree at least. The paper is here on SocArXiv, and the Stata code is here. On Twitter, users have the option of blocking other users, which prevents them from viewing the blocker’s tweets, getting notified when they tweet, and participating in the comment thread below the blocker’s tweets. Apparently, Donald Trump’s Twitter account has started blocking people who criticize him. As of yesterday, I’m one of those people. My case illustrates how Trump created a public forum, used for official purposes, and then excluded me from participating in that forum on the basis of my political opinions. My memes and statements were viewed by hundreds of thousands of people, according to Twitter’s analytics, often appearing right below a Trump tweet. Clearly, this is not what the President wants, but just as clearly it is one small part of how democracy works these days. Here are a few examples of images I made and posted, or comments, with links for people who aren’t blocked so you can see them, screen images to avoid that (if you follow the links you can see the discussion in the threads). You get the idea. Maybe putting up these memes feels like carrying a sign at a protest, but in this case it’s a political forum organized by the President and limited to those he selects based on their political statements. I don’t know how this legal argument will fare in the courts, if it gets there, but in this case as in so many others, his actions are bad for democracy.